How do you follow up a massive hit single? This week in 1988, three of the new entries on the ARIA singles chart attempted to answer that question - with mixed success. Do you repeat the formula that made your previous single a hit and assume that if people bought it once, they might just buy it again? Music history is littered with examples of that working - and there's something to be said for consistency. At the same time, repeat performances don't always work... as we'll see. One artist who did seem to have worked out a hit-making formula was Robert Palmer, at least when it came to music videos, and he was still riding hit at number 1 with "Simply Irresistible" this week in 1988. Intended for Keith Sweat, later covered by *NSYNC, this early new jack swing track was a US top 10 hit, but in the days before Bobby Brown took off locally, it flopped here. Two years after they'd last seen the inside of the top 50 and even longer since they'd had a substantial hit in Australia, new wave pioneers Devo bombed out with this Total Devo single. His debut solo single in 1970 - it reached number 51 in Australia - "After Midnight" was re-recorded by Eric for a beer ad and re-released around the same time as he had a couple of retrospectives on the albums chart. After two massive hits in the shape of "The Flame" and "Don't Be Cruel", this third singles from Lap Of Luxury missed the top 50, just as "Ghost Town" would do when released next. Before we get to those follow-ups, here's the debut hit by the UK band who found much greater success in the US with their "white soul" stylings. Granted, glacially slow ballad "Hands To Heaven" reached number 4 in the UK, but the Johnny Hates Jazz-esque group didn't score another top 40 hit there. Instead, they landed three consecutive top 10 hits in America, including a re-release of debut single "Don't Tell Me Lies", which had flopped back home in 1986 and is one of two songs of theirs I like. The other? "Say A Prayer". In Australia, "Hands To Heaven" missed the top 100. 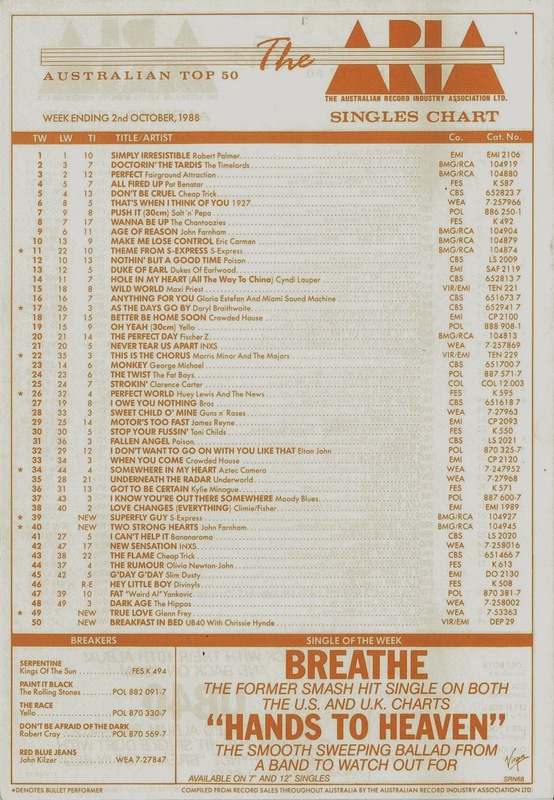 Here's a song that would spend an awfully long time as a breaker (it was still showing up at the bottom of the ARIA chart in mid-November) but never managed to crack into the top 50. Another of those all-American songs like "I Wish I Had A Girl" by Henry Lee Summer, "Red Blue Jeans" wasn't even a hit back in the US of A - so I'm not sure why we got stuck with it. I was going to describe UB40 as the world's most famous reggae band until I realised I couldn't actually name another. Chaka Demus & Pliers? They're a duo. Bob Marley & The Wailers? I guess they're technically a group, but surely that's like considering Prince and the Revolution (or the New Power Generation) to be a group. 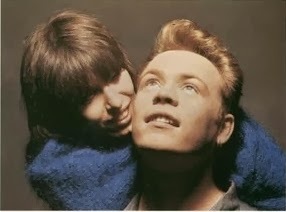 Anyway, whatever way you look at it, UB40 are one of the best known proponents of the genre - and they'd previously hit the Australian number 1 spot with a cover of Sonny & Cher's "I Got You Babe". Their guest vocalist on that track was The Pretenders frontwoman Chrissie Hynde, who returned to appear on this remake of "Breakfast In Bed", which had originally been recorded by Dusty Springfield. Despite having all the elements of "I Got You Babe" in place, UB40 weren't as lucky with this second attempt at a hit duet - although "Breakfast In Bed" did much better in the UK, reaching number 6. He'd spent the middle of the decade providing hit singles for the soundtracks of Beverly Hills Cop ("The Heat Is On") and TV's Miami Vice ("You Belong To The City"), and now The Eagles member launched his third solo album with this single, which for some reason my Cure-loving sister bought on 7". It's not a bad MOR song, if you like that sort of thing (and I often do) but also kind of forgettable. The second of our follow-ups, and "Two Strong Hearts" had the unenviable task of coming after the first single and title track from Age Of Reason, which had made a huge debut at number 3 before spending four weeks at number 1. This debut position wasn't a good start, but the track, which was bright and breezy where "Age Of Reason" had been earnest and impassioned, soon made its way into the top 10. And so, in this case, it seemed doing something different paid off, especially for John, who sold so many albums that managing multiple hit singles was not a given. 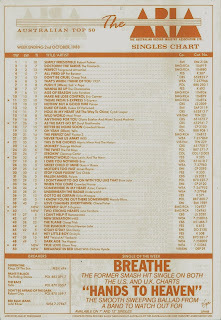 "Theme From S-Express" had succeeded where so many other club hits didn't in Australia, peaking at number 11. For their second trick, it was another sample-heavy, disco-flavoured dance track which didn't find as much favour with the record-buying public. Despite the fact that the group led by Mark Moore still had a couple of good singles left in them, "Superfly Guy" would be S-Express' last appearance on the Australian charts until "Theme..." received a remix in 1996. So, based on this week's new entries alone, it would seem that it doesn't pay to repeat yourself. Next week: one of favourite songs for 1988 debuts (and a handful of songs I'd rather forget), but before that, I'll conclude my countdown of my favourite songs from 1997. Inner Circle were another reggae group who had some (brief) success in Oz... but yes, it is difficult to think of other reggae groups. I think I blocked them out of my memory. A couple of hideous hits! I don't recall hearing 'Just Got Paid' before, but the bass line sounds, to me, like it was re-used (albeit at a slower tempo) for Jennifer Lopez's 'If You Had My Love' (with the chorus being sung over it). Or at least a very similar progression of notes.